Experience a regenerating cleanse with the BABOR Soothing Shower Milk, a moisturising body wash that conditions and balances the skin whilst lifting away dirt and impurities. 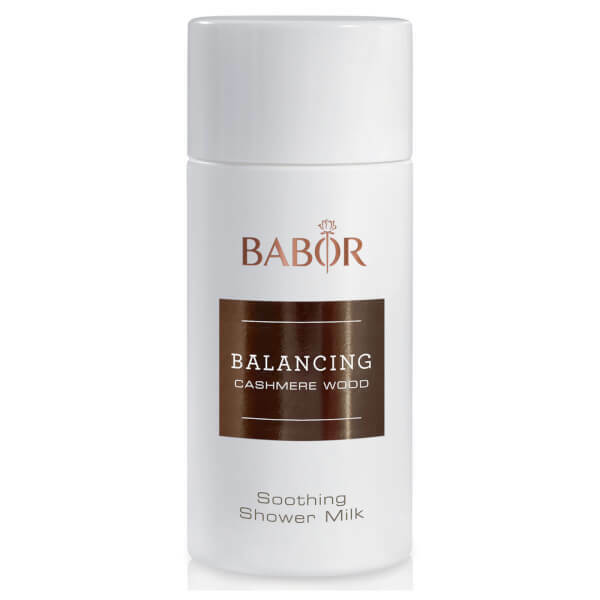 Infused with a host of precious plant oils, including Argan, Sunflower, Olive and Sweet Almond, the shower milk effectively cleanses, softens and nourishes skin; its balancing and regenerative properties promote smoother skin and help to relieve feelings of tightness. Protective and cleansing, its dose of Champagne Pear Stem Cells and Vitamin E keeps skin safe from free radicals. Infused with a warm, woody fragrance. Apply to skin during a shower. Aqua, Cocamidopropyl Betaine, Glycerin, Cetearyl Alcohol, Helianthus Annuus Seed Oil, Coco-Glucoside, Glyceryl Stearate Citrate, Prunus Amygdalus Dulcis Oil, Olea Europaea Fruit Oil, Decyl Oleate, Argania Spinosa Kernel Oil, Tocopheryl Acetate, Disodium Cocoyl Glutamate, Phenoxyethanol, Parfum, Panthenol, Sodium Chloride, Xanthan Gum, Glyceryl Oleate, Citric Acid, Sodium Cocoyl Glutamate, Hexyl Cinnamal, Ethylhexylglycerin, Potassium Sorbate, Alcohol Denat., Caramel, Pyrus Communis Fruit Cell Extract, Linalool, Lecithin, Ascorbyl Palmitate, Glyceryl Stearate, Pantolactone, Maltodextrin, Ci 16035.